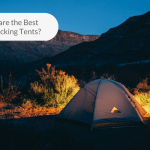 In this article, I have shortlisted some of the best family tents that your family will be spending a couple of nights in. Looks like you are going for a camping trip with your family soon. You must be excited by now, looking up on the web where to go and what to do. It can be fun and beneficial for the family relationship while you are camping with them. Activities such as setting up the tent, building a campfire and playing games allow you to interact more with your loved ones. After a whole day of action, your family will settle down in a nice cozy tent and have a good sleep. 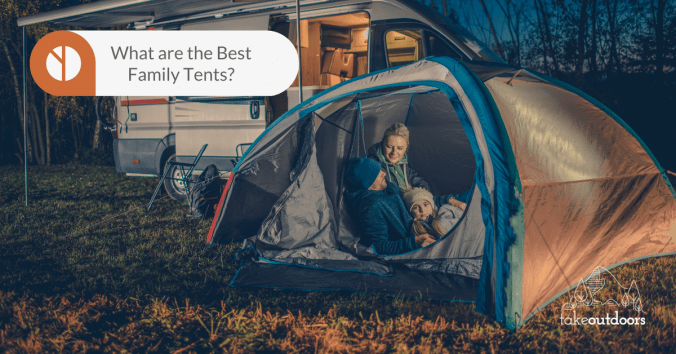 Finding a family tent can be a time-consuming task. Each tent serves a different purpose and works well for a different environment. It can be quite hard to find the most suitable one for your trip. This article is written to help you narrow down your choices. Is your family going to use the tent for summer only or you are planning to use it for all parts of the year including winter? 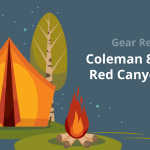 There are 2-season, 3-season and 4-season tents out there in the market. 2-season tents are designed for good weather such as in summer and spring. It can cope with mild rain and the wind. 3-season tents can be used in fall and can stand up to heavier rain and winds. 4-season tents can be used in winter. It is also designed to handle even stronger wind and other harsh conditions. The more seasons the tent can handle means the stronger the material is. At the same time, the tents are heavier. Most people go for 3-season tents. But, you can go for the 2-season tent if you are planning to camp in the summer or in good weathers only. One thing to note is the capacity that the tent can hold. Even if the specification says it can hold 6 people, they can fit nicely but there won’t be room to move around. You wouldn’t want to wake up in the night, kick or stand on to someone when you are walking to the toilet. Or, if you are someone who likes to toss around in bed, you might end up elbowing someone. 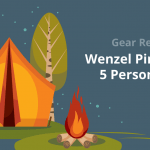 For families, I recommend an 6 person tent for a family of 4 and a 8 person tent for a family of 6 for comfort. Another thing to note is the tent pad sizes that the campsites offer. If you are using a tent with large floor space, please make sure it can fit nicely on the tent pad. A good advice is to give the campground hosts a call and tell them your tent size. After that, you can ask if it would fit, then make the reservation. Knowing the type of material the tent uses is valuable. 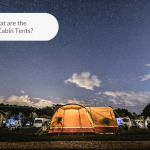 Let’s talk about the two common fabric used in family tents, canvas, and polyester. Canvas is heavy because of its thick fiber. It absorbs water as well so it becomes even heavier when it’s drenched. Brand new canvas needs to be weathered to be waterproof. You can setup in your backyard, spray some water on it or let the rain do the job, then let it dry. The advantage you won’t feel humid as the fabric breathes very well. Canvas has good insulation. This tends to keep the room temperature warm in a cold weather and cool in a warm weather. It will also last decades if you take good care of it. There is information out there on how to maintain the canvas. Polyester is lighter and also much cheaper than canvas. It dries quickly as well so you can pack the tent faster. But, it does not breathe very well. This can be a problem because the tent will have condensation. New campers sometimes mistake the condensation as a leaky tent. Some people even reported the condensation created a puddle in the tent. You can fix this issue by opening up the doors and windows for better ventilation. Canvas tents can take a longer time to setup and teardown because of its weight and is water absorbent. Polyester, takes lesser time to setup and teardown since its lighter and it dries out quickly. If you are planning a long stay outdoors and wants to live comfortably, a canvas tent can be a good choice. Otherwise, a polyester tent would do. If you are planning a long stay outdoors and wants to live comfortably, a canvas tent can be a good choice. Otherwise, a polyester tent would do. Lugging a heavy tent to the campground even when it is packed is no joke. You should consider the distance between the unloading point to the campground. If you are driving directly, this shouldn’t be an issue. Also, consider the people that help you to bring the stuff over. Other than weight as a factor to the setup time, the pole structure also makes a difference. The lesser the poles are, the faster you can set up the tent. There are many types of tent poles to choose from. The common ones for family tents are fiberglass, steel, and inflatable poles. Fiberglass poles are flexible but bend easily. It can also become flat if a heavy object falls on it. Because of this, they wouldn’t hold a very large tent well. They can also shatter rather than snap when broken. This can destroy the tent and may even cause injuries. Fiberglass poles are better used in dome tents as its flexibility can conform to the shape. Steel poles are rigid so they don’t bend easily. They are very durable. Steel pole holds a very large tent well. Yet, they are more expensive, bulkier, heavier and better used in cabin tents. Inflatable poles come with polyester encased inner tubes. When filled up with air, the pole will be stiffened and become the skeleton for the tent. The polyester enclosure protects the tube from punctures. It also contributes stiffness to the structure. Tents with inflatable poles have very fast set up time because you only need to pump air in the tube. Yet, this requires an air pump which contributes to the weight you have to carry. It is also easy to repair, you only need to patch the area that was punctured. They are the most expensive out of all the poles mentioned over here. Do set a budget before buying a tent. Price makes a difference on the quality and the features you get in a tent. You may have to trade off the quality of the tent fabric or tent poles for an affordable price. However, this might mean that your tent might not last long or cannot handle bad weather. Knowing which features you are willing to give up will help you get a price that you are comfortable to pay. Many people recommend having a rainfly covering from the top to the ground to protect themselves from a long period of rain. Some tents only come with rainfly covering the top. The tent walls are not waterproof. Breathability allows good ventilation also allows the rain to come in. If you don’t want to worry about a leaky tent, a tent with a full rainfly is the way to go. I recommend having at least two doors in a tent. This not only helps in a person exiting the tent comfortably (not walking over someone that is). It also allows the air to flow freely, improving ventilation. With more windows, you can enjoy more sunlight, and also better ventilation. Some tents have a hook at the center ceiling to hang a lantern. This is convenient so you don’t have to tie a loop to hang your lantern at the top. Some tents also have pockets in the tent to keep small items. This is useful if you don’t want to have things flying around in the room. A lot of people have thought of cooking in the tent. Some people may want to avoid the rain or just want to be doing everything in the tent. My advice is not to do it at all, the risk of fire is there. There may be some materials that are fire resistant but it just means they take more flame to burn. Once they catch a fire, it burns really quickly and may cause fatal injuries. There is also a risk of carbon monoxide poisoning. As carbon monoxide is an odorless and colorless gas, you will never know when your life is being endangered by it. Unfortunately, a person was killed just by storing a used barbecue inside the tent. This tent will sleep 4 people comfortably as you can fit two queen-sized air mattresses. After fitting the queen-sized air mattress, you still have enough room to move around. There is also an optional divider where you can separate into two rooms to create more privacy. The WeatherTec system features inverted seams and welded floor. This system prevents water from leaking into the tent. You will be able to sleep in peace even when there is a rain. I really like the fact that they have a hinged door, this allows easy entrance and exit of the tent. It also gives the feeling of a door to your hotel room. The tent breathes well as it has windows all around and a roof full of mesh. But, this won’t work well for winter as it lets cold air in easily. Many people are able to get the tent up in about 20 minutes which is decent for a set-up time. The poles are made from fiberglass which is light and does not need a lot of effort to set up. The trade-off is it may seem too flimsy and the tent might collapse from a strong wind. This tent deserves our top five because of its space. Plus, the ease of setup and some interesting design like the hinged door. This is a dome style tent and it comes with a full rainfly so you no need to worry about the rain even if it is a heavy windy one. If you remove the rainfly, you will have the full view of the stars. It has a good ventilation system as it is full of mesh. But, the trade-off is the lack of privacy. If you don’t leave the rainfly on, you will be in full view of everyone. There are also two doors so you won’t have to walk over someone to exit the tent unless you are sleeping in the middle. The doors come with noiseless zippers. You can safely sneak out of the tent without waking up your family or friends. It comes with two vestibules. The space inside the tent won’t be compromised as you can put your bulky gear outside. There are plenty of storage pockets to put your smaller items. There is also an additional gear loft which adds more storage space. The color coded clips and pole sleeves allow quick attachment of the poles. There are also twist clips that you can put the clip on the poles then rotate it to lock it to the tent fabric. The poles are made from aluminum which are stronger than fiberglass. It also holds the tent well against a strong wind. The tent is relatively lightweight, easy to carry around because of the fabric and poles. It is recommended to put a footprint underneath the tent as the floor is thin and it may get tear easily. Other than the thin floor, this tent seems like a solidly built tent. It comes with a good amount of storage compartments. You can live comfortably inside even when the weather is bad. Tall people will love this tent because of its tall design. It is a spacious tent that can hold up to 7 people. The comfortable amount would be to have 5 or fewer people in it with plenty of space to move around. It comes with a mesh roof that allows air to flow in easily. At the same time, your family or friends can enjoy star-gazing. If you want extra privacy, there is a removable divider curtain to separate the tent into two rooms. The shock-corded fiberglass poles make the assembly of the tent easier. In my opinion, the price is worth it for its size and air circulation. However, the tent is known for not taking the rain well and still gets some leakage. This can be solved by applying waterproofing treatment before bringing it outdoors. The door zipper seems to be a known issue as it always gets stuck at the seam flap. This gets our top five as the price is good and the tent is spacious. This tent can be a good choice for either camping in the backyard or in a fair weather environment. Tall guys will love this tent because of its high ceiling and they can stand up straight without hitting the roof. However, this may pose an issue for shorter people when setting it up and tearing it down. There is a solar shield that prevents direct sun exposure and keeps the tent cool. The floor is made of durable and thick material so you don’t have to worry about punctures and tears putting it on a rough ground. The tent has two rooms, front and back, which are separated by a divider curtain. There are two doors which are convenient for the entrance and exit. But, they don’t have screens which some people may mind. The front room is accompanied by a large number of windows. The whole ceiling is mesh. When opening up all the windows and the roof, it gives good air circulation and provides a good view of nature and the sky at the same time. The back room has smaller windows for more privacy. There are no storage compartments which can be annoying as you may leave things flying around. There is also no hooks to hang a night lamp. The instructions are unclear. There is no mentioning of two poles that are shorter. These two poles should be installed at the last section of the tent or the room at the back. You may need more people to carry this to the campground as it is heavy. This gets our vote as it has great ventilation and is a budget friendly large tent. Putting your air mattress in the front room, you will have a good view of nature and the sky when you lie down. If you don’t mind leaving your things around in the tent, or if you have your own storage boxes, this can be the one to go for. This tent can fit four people comfortably. Six people and it might get a little too squeezy. The height is good for most people and its almost vertical wall provides more living space. There are windows on all sides and are large as well. The roof is also full of mesh. Having these two, the tent becomes very airy, yet providing a good view of the scenery. The windows have toggle where you can partially close the window for privacy but still have ventilation. The steel poles that come with the tent keeps it sturdy and prevents it from collapsing from strong wind. There are pockets in the tent but they are located at the top of the tent. This is a minor design flaw as people usually prefer the pockets to be at the bottom. There is a hook to hang your lantern but it is lightweight and seems not stable enough. The floor is thin so it’s better to put a thick footprint below the tent. Other than the thin floor and bad placement of the pockets, this tent makes a good choice for its airy space and sturdy structure. To conclude this post, I would pick Kelty Trail Ridge 6 as the winner. Good quality of materials and the convenience of multiple pockets in the tent are the major plus for this tent. I would also feel confident bringing this out to brave the bad weather. You can see efforts being put into the design of this tent as it looks at minor details such as noiseless zippers, color-coded clips, twist clips and two vestibules by the door. 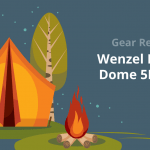 The dome shape of the tent means you won’t be able to stand up straight anywhere in the tent unless you’re in the center. If this is alright for you, then there’s your answer.